Shy Radicals,published by Book Works, 2017. All rights reserved.Hamja, a campaigner and art curator, isn’t an ordinary interviewee. Turning up in his Manic Street Preachers T-shirt, he looked intense the moment I saw him. He showed me into his local café in Tooting, the part of London town he grew up in, and pointed me to the table in the corner where he sat writing most of Shy Radicals: the Anti-systemic Politics of the Militant Introvert, a rare book that made me laugh and one that has puzzled many. I suppose we read each book with the weight of our own history, and then our baggage merges with the author’s own. When I read Shy Radicals, a little girl came alive: the little girl who was silenced the moment she was brought into a class in a primary school full of pupils older than herself. Her grandmother worked as a full-time teacher there and had decided to let the school do the childcare for her. The child’s mum and dad lived in the city and were too busy to look after her themselves. Barely five, this girl only knew how to be silent. She was made to sit through classes where loud pupils around her were keen to show their enthusiasm by collectively reciting stories and poems. They raised their hands, and answered every question put to them by teachers loudly and clearly. The little girl uttered no words, which marked her out as different and therefore odd. For the rest of her time in school she underwent extra training by a well-intentioned teacher who was determined she must be cured of her quietness. In fact, this girl wasn’t “normal” to start with. A year before her parents sent her to her grandparents, she had undergone “correction” by the adults around her to stop her writing with her left hand. Many children were made to learn to write from the age of three. The use of the right-hand was the correct way in society. Only unwanted rebels used the left hand. Like the kids who choose quietness, they are often treated as a problem. As this child was growing up among extroverts, she began to secretly dream up her own world, a world free from the oppressiveness of extrovert adults. Reaching seven, she started to write stories about her isolation as a misfit. Kids from the neighbourhood who came to play happened to read the stories and some were drawn into them, sitting quietly in the corner of the room, absorbing the words. The stories struck a chord. They asked for more to read. The small child realized she wasn’t the only “strange child”. There were many introverts and “misfits” like her, who couldn’t conform to the rules of extroverts. That small child was me. That introvert lasted in me and enabled me to see the politics of the personal. When I read Shy Radicals, I could relate to “Aspergistan”, a concept similar to the paradise I created in my writing at the age of seven as an isolated child. As it turned out, Hamja told me that he had wanted to write the book for a long time and wishes to connect with people with similar experiences and emotions. Hamja became an atheist at the age of thirteen. “I used to see enlightenment as a good thing. But later I learned more about colonialism, and how colonialisms connected with rationality and become embedded in law and science… I began to see atheism like a nineteenth-century liberalism and I found it hollow…”. During his experiment with atheism, Hamja was also experiencing extreme depression and finding solace in a range of music. From the Palestinian intifada music, the Irish Republic songs and the Bosnian blues, to what he calls “the Sensitive White Man” music -- he got into Nirvana and the Manics, who used to talk about depression in a way to which he could relate. The bullying carried on, all the way to when Hamja was seventeen, when he was diagnosed for depression for the first time. He attempted suicide during that year. “I was seen as a cause of concern although I got very high grades at school… I swallowed the excessive amount of tranquilizers they gave me… I didn’t see a future. I was so shy that I felt I couldn’t fight things on my own. I was wondering how I could cope with adult life…”. Throughout his adolescence and early adult years, the need and the desire to write Shy Radicals had always been there. As someone who was bullied, Hamja felt that he didn’t have role models or historical allegiances to turn to. The notion of hate crime does not cover crime committed against people who have become victims simply because they’re different, he said. He has wanted Shy Radicals to become a voice for them. Hamja went to university slightly later than his peers. But studying art in St Martin’s helped him turn a corner and extract himself from being an “outcast”. “It was only in my mid-thirties that I had some sort of acceptance of who I am… The acceptance that I don’t like clubbing and partying and it’s fine.” Largely through social media, he was able to find another landscape of identity in cyber space where he could see other people who were also bullied. The experience of racism is also part of that identity. “We [South Asian Muslims] have a sub-culture that is a bit less hedonistic… not getting drunk and feeling a bit out of place… At times I did receive racial bullying…which made me feel a sense of despair,” Hamja said. He pointed to the Chicken Cottage shop across the road as we walked along and said this ordinary venue was a large part of his growing up as a South Asian youth. “It was one of the places I used to hang out… Tooting is where recruitment for young Muslims to fight in Bosnia happened, right here at the Chicken Cottage...”. But of course these places have been gradually replaced as youth venues, as gentrification sneaks into the area. As an artist and curator, Hamja was keen to seek out alternative spaces for the young. He got involved in organising DIY Cultures, which consists of a huge variety of non-loud workshops and activity for young people. In those five years, he developed it as a stimulating place where young people could spend time, interact and exchange ideas with one another. And as introverts, “we need to preserve spaces where we can sit in the quiet… like libraries, like a lonely cathedral, like in the Catholic church near Leicester Square…”. “Shy Radicals is Black Panthers for shy people,” Hamja said. Much of his writing style is legalistic and poetic, influenced by his interest in prison writing. Each page is filled with humour, a lot of it dark, which makes it fun to read. 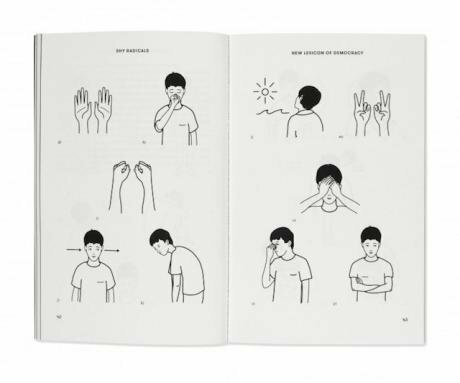 “Aspergistan is a safe haven for all Shy, Introvert and Autistic Spectrum people everywhere.” “The Shy People’s Republic of Aspergistan is an independent Pan-Shyist state representing the interests of all Shy, Introvert and Autistic Spectrum peoples”. “Aspergistan honours the struggle of the Introfada in the liberation of the homeland and the freedom, tranquillity and well-being of the Shy peoples…”. “Shy Radicals is Black Panthers for shy people,” Hamja said. Much of his writing style is legalistic and poetic, influenced by his interest in prison writing. The humour is intrinsically linked to suffering and oppression. There’re a lot of references about his and other British Muslims’ experience with state surveillance, in particular with Prevent. Thus the vocabulary, “Shy radicalisation”. “Shy Radicals is not a terrorist organisation. Terrorism is always loud.” “The extrovert state is a terrorist state.” “The extrovert world order at present is the greatest purveyor of terrorism in the world”. Hamja said that he truly became politicised in February 2006, when anti-terror police raided his family home and arrested his brother, Talha Ahsan, on suspicion of terrorism. Talha was a SOAS graduate, a poet and translator, and he didn’t stand out in any way in his academic and public life. But somehow he became a suspect on the basis of an online document (which turned out to have nothing to do with terrorism) that passed through him. Talha had always been a shy person, and had been diagnosed with Aspergers syndrome. Prior to his arrest, he was preparing a job interview to become a librarian. While suffering from the social stigma of being autistic, and feeling like an outsider in a “neuro-centric” world, he was at the same time treated as a second-class citizen for being a Muslim. And so the world was divided into Hereistan and Thereistan. You can’t call it revenge if the killing occurred at the same time. Those killings feed into each other like a swirling figure of eight in blood. The numbers grow. Infinity groans and falls to his side. Murderers are best left unasked about their views on euthanasia. Each grapples for the beginning of blame as the knife yielding hand reaches for the end. In conflict their limbs are more interwined than the bodies of lovers wrestling over a capital disputed both call Murdabad. If only this mobius strip simply existed in pastry and the roar of the mob was only hot oil incited. The geometry of death weaves a map with a pattern of disease across a terrain each calls mine. Where do you go? Where would you live? Is your country the one you will be born in or the one you died in? The vultures decide with their droppings. Those who yearn to belong to that country of birds whose geography is air are shot down by brats with catapults and made to endure hard labour in a cage. Your mother tongue is not the one you read or write but with which you dream, laugh and scream in under torture. Welcome to Otherstan! It is between the gaps of words; the hollows between syllables. The linguafranca is of sighs, yawns, burps and sneezes. Its rivers are no better than running noses. Its hills and mountains disappointing as any lover’s knees. Otherstan: a republic where each man is king because each woman is a king maker. Our national anthem is a minute silence. Eventually the abacus tips, the number of dead is too large. The sand timer is too heavy to lift. The fruits on branches grow rich with flesh. They pump out like cheeks swelled with vomit. The trees creak off their knees, straighten their backs and raise a head of laughter to the sun. The water rumbles with fish. O earth, earth, earth, hear the word of the Lord: be the better son of Adam. Take an oath of realty with me: I remain truely an Otherstani. Hamja’s life was transformed. “There was a lot of love and sympathy from people for our family... For the campaign, I went all over the country, Glasgow, Cardiff, Manchester, Cambridge, Bradford, Leeds, and I’d be able to stay at someone’s house… People told me that I inspired them to speak up… I felt that a positive community of solidarity was created… Shakar Ahmed’s wife came to see my mother even when they were going through unjustified treatment… which I found so moving.” [Shakar Ahmed was held by the US in Guantanamo for more than thirteen years without charge.] Talha was released back to Britain in 2015. 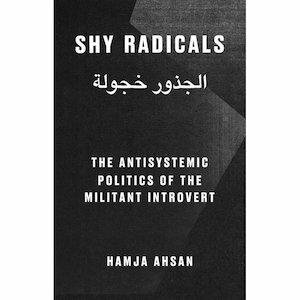 Shy Radicals: the Anti-systemic Politics of the Militant Introvert is published by Book Works, 2017.